In the summer of 1969 the Integra name made its first appearance in consumer audio with the Model 701 integrated amplifier. At the time a moniker, it was then used to identify the pinnacle of technology of each product category the parent company designed and engineered. For 30 years it served the purpose as a prestigious badge of honor. The 11.2 channel DTR-70.6 A/V Receiver offers major flexibility. Build a 7.2.4 Dolby Atmos theater (7.2 plus 4 Dolby Atmos height channels) or a 5.2.4 Dolby Atmos theater (5.2 plus 4 Dolby Atmos height channels) with independent powered audio & video for zone 2 and an independent line level-audio for zone 3, or a 7.2 standard theater with independent audio & video for zone 2 and an independent powered audio for zone 3. Keeping up with the options? There are also 11.4 preamp outs for use with separate power amps. 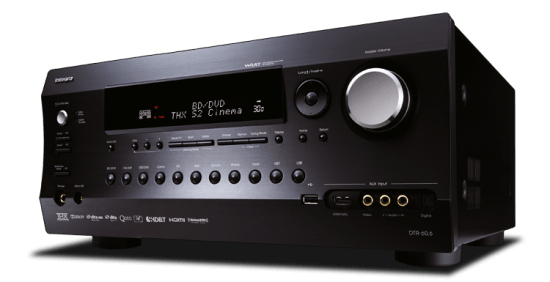 The DTR-60.6 A/V Receiver with 9 output channels gives you choices. Build a 7.2.2 Dolby Atmos theater (7.2 plus 2 Dolby Atmos height channels) or a 5.2.4 Dolby Atmos theater (5.2 plus 4 Dolby Atmos height channels) or a 7.2 standard theater with independent powered audio & video for zone 2 or a 5.2 theater with powered zones 2 & 3. The DTR-60.6 also features 11.2 preamp outputs so you can add another 2 channel amplifier to create a 7.2.4 system. From solid alloy faceplate to gold-plated XLR pre-outs, the DHC-80.6 exudes audiophile quality. Triple transformers power cutting-edge processing technology for Dolby Atmos® theater sound or multizone A/V entertainment. Behind the simple facade of the THX® Ultra2™ certified DTA-70.1 lies more than enough amplification muscle to power even the most demanding home theater. Enjoy diamond-sharp precision, whatever the volume. Integra products are designed and engineered to meet the demands of custom audio/video systems installers. The ADM-30.1 has input level adjustment, auto on function and 12V remote on/off switch with selectable turn on and audio sense 12V trigger modes. Optional rack mount kits for all models provide a clean, finished look when installed in racks and cabinets. Integra works closely with control systems partners such as Savant, Crestron, URC, and RTI, and supports Control4 Simple Device Discovery Protocol (SDDP) and AMX Device Discovery for simplified system integration. A complete list of Partners can be found here (provide link to Partners page). So when it's "Movie Time" everything operates seamlessly and intuitively. Now that's "Integra"tion! The Integra brand connotes quality, style, and performance. Websters dictionary defines integrity, the brands namesake, as a rigid adherence to a code or standard of values, which is exactly what you get with the new CDC-3.1. Its a full featured six-disc carousel CD changer that's built to tighter tolerances, in terms of both fit-and-finish and its circuitry, to deliver audio performance that a critical music lover requires.